Well the polls have closed [BUT THE 2009 POLLS ARE OPEN! ]and I have to say, the results were interesting and just what we were looking for. There were lots of great restaurants that came out on top, while the chains didn't fare so well, except in categories where you'd expect them to. Voter turn out was respectable considering we didn't really publicize this much beyond our readers. This was always meant to be a poll for foodies, by foodies, so thank you to all the foodies who voted. We hope you enjoy the results as much as we did. NOTES AND COMMENTS: Since the form fields were free form, we tried to interpret the results as best we could. If you'd like to double check our work, feel free to look at the raw data. No member of the GFC team voted. Since this was such a small sample size and some of the categories were so close, some of the results would be different if our votes were counted. 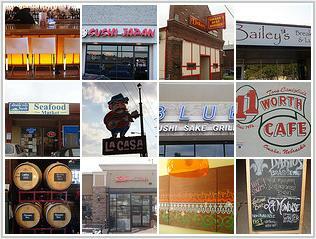 Cafe De Paris, Elada, and Trovato's each got at least one vote, despite being closed. With such a great response, we plan to do this again next year, with some new additions thanks to comments from our voters.